Hey there! I'm Kim, and this is my first blog post + Friday Introduction crossover/mashup/remix. If you don't know what a "Friday Introduction" is, no sweat. I'm about to break it down for you and tell you why it's part of a much bigger picture. 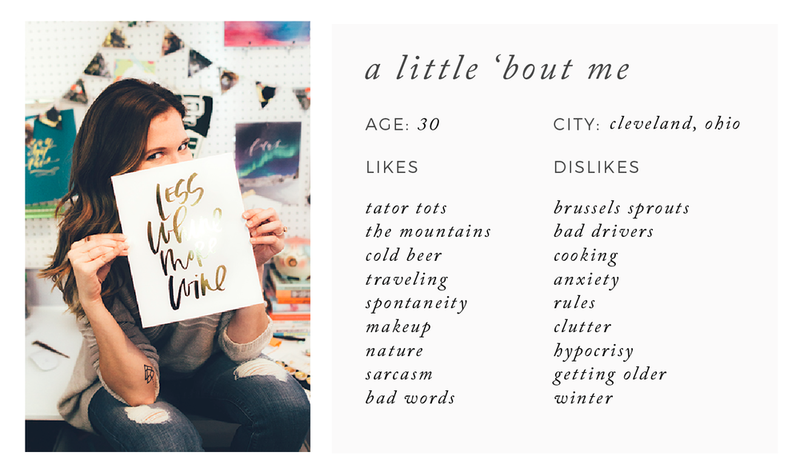 "Friday Introductions" is an Instagram trend that gives bloggers, influencers, and small biz owners (ahem, moi) the opportunity to introduce themselves to their followers. On Fridays. They post a picture (usually of themselves) followed by a caption with some "fun facts" or "about me" tidbits that provide a glimpse into their lives, their personalities or quirks. Why Fridays? Don't know. Maybe it has something to do with Fridays being more chill and therefore the perfect day for sharing something a little different. Or maybe it's because everyone is usually checked out by Friday and more likely to scroll through Instagram, making it the optimal time to reach followers. In any case, the trend speaks to a larger idea—that there are real, living and breathing humans behind those little squares and carefully curated hashtags. Think of some of the brands you love. Now think about why you love them. There's a good chance the brand or biz you're imagining has emotionally impacted you in some way. Think: tearjerker TV spots, comical ad series, and kickass social media accounts. Of course not all of us are equipped with the dollars to support big budget advertising, so we have to improvise and think of cost-free (or at least affordable) ways to reach our audiences and make that emotional connection. One of the ways we do that is through platforms like... wait for it... Instagram! And now we circle back to Friday Introductions. This trend is just one of several ways to show your followers who you are and what you're all about, whether you're a blogger with sponsors and affiliate links, a budding lifestyle photographer, or a solopreneuer doin' her thang. See? That wasn't so bad. It's nothing fancy because it doesn't have to be. There aren't rules that say you have to do this on Fridays, on Instagram, or even at all. It's not always about pushing your products or services. Believe it or not, people want to feel as though they can relate to YOU. It's especially important in heavily saturated markets where differentiation is key. Use your big, bad, bold + wonderful self to your advantage by immersing who you are into your brand and content. Because no one is you, and that's what makes you stand out from the rest.